The recent Summer Garden Party held at Anchor’s Keble Court in Fleet on 15 September was a huge success. 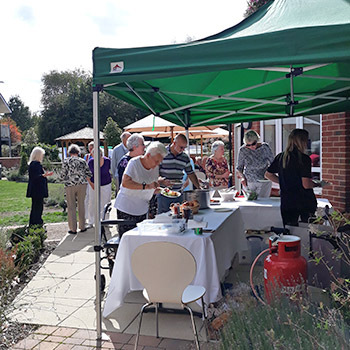 Visitors on the day were treated to a delicious BBQ with Pimms and musical entertainment in the grounds of the luxurious retirement apartments. Visitors also had the opportunity to look around the beautiful development, see the communal facilities and speak to residents about what life is like living at Keble Court. If you missed this event then why not attend our Cinema Event at Camberley Theatre on Tuesday 9 October where we will be showing the Academy Award nominated film Darkest Hour.